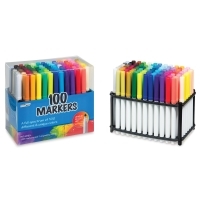 This marker set offers a complete range of 100 colors packaged in a convenient plastic caddy. The versatile bullet nib can be used for fine details, as well as for bold, thick strokes. The markers contain brilliant waterbased ink that is acid-free and non-toxic. The ink is washable from skin and most fabrics.